A surprised George Milford has been recognised for his work promoting the heritage of Harcourt, its unique granite houses and for his volunteer work involving house museums, art galleries and vintage machinery clubs and associations in the broader Goldfields region. Mr Milford’s work began in the 1970s as an office bearer of Castlemaine Art Gallery and Historical museum and Harcourt cemetery. He has also been a trustee of Buda house museum since 1981. And he has lent his time and talent to conservation works at Duneira historic hill station in Mt Macedon. As a former employee of Thompsons Engineering Works in Castlemaine, Mr Milford was also involved in efforts to preserve and save the extraordinary collection of machinery and drawings from Thompsons – some ending up at the Maldon Vintage Machinery Museum and in the archives of the University of Melbourne. He has been heavily involved in all manner of volunteer work to promote the history and heritage of Harcourt – from Secretary of the organisation that celebrated 150 years of settlement in 1995 to the Harcourt Valley Heritage and Tourist Centre Inc as well as writing the definitive history of the granite houses of the region. The Ray Tonkin Heritage Volunteer Award will be presented by Stuart Macintyre, chair of the Heritage Council of Victoria at the Modern Melbourne film screening at Bendigo Open House on 27 October. In addition to a framed certificate, Mr Milford has been invited to nominate a recipient organisation for a $2000 heritage project donation from the Heritage Council. 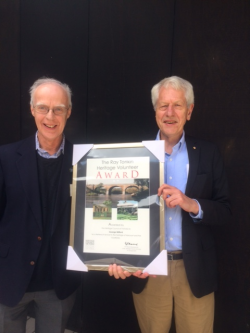 The Ray Tonkin Award, named after the former Executive Director of Heritage Victoria, was created eight years ago by the Heritage Council of Victoria in recognition of the significant role volunteers play in the maintenance and preservation of Victoria’s cultural heritage.